Francis Muthoni, geographic information system specialist at the IInternational Institute of Tropical Agriculture (IITA) in Arusha, introduces himself and his work with the program. It is one of a series of portraits of key people in Africa RISING. I hold a PhD in spatial ecology and MSc in Geo-Information and Earth Observation in Environmental Modelling and Management (GEM) from University of Twente-ITC in Netherlands. My research interests revolve around application of geospatial tools in natural resource management in agro-pastoral landscapes and I am also interested in spatial statistics and programming in R.
Project (TEP). I also previously trained local institutions and community groups on the use of geospatial tools for mapping natural resources in rangelands. I helped establishment of Ishaqbini Community Conservancy for conservation of endangered Hirola antelope. I use geo-spatial data and models to generate recommendation domains for scaling out best-bet agronomic technologies under the Africa RISING-NAFAKA scaling project. The recommendation domains are locations in the landscape with biophysical and socio-economic characteristics similar to pilot sites where particular technologies were tested. Identification of these domains is expected to improve targeting of sites for scaling out agricultural technologies. Scaling out agronomic technologies in the recommended domains is expected increase probability of success due to their similarity with the pilot sites. What are your plans for Africa RISING –NAFAKA project (i.e. your next bit of work)? My immediate plan is to collate relevant geospatial data relating to biophysical and socio-economic variables of the project action area. Biophysical data relates to elevation, rainfall and temperature that are largely acquired from remote sensing satellites. Socio-economic data using spatial models includes the population distribution and access to markets that are largely generated using spatial models. What do you find unique about Africa RISING-NAFAKA partnership project? The partnership is very unique as it fosters both research and development. The project has a multi-disciplinary team originating from local to international organizations. Despite the diversity of the team composition, they share synergies in fostering both research and development. It therefore enables scientists to come from ivory towers (laboratories and scientific journals) to the farm level where they get to work directly with the small holder farmers, on how to apply agricultural technologies. I also find the fact that the project also focuses on improving nutrition among the small holder farming communities as a unique thing. This is because it means that the team recognize that rural farmers do not only need to increase productivity, but also improve their nutritional uptake to improve health. What are the biggest Africa RISING-NAFAKA challenges and how do we deal with them? In my opinion the main challenge is in adoption of technologies that are demonstrated to farmers. Current farming system in the project area is to a large extent influenced by socio-cultural norms like preference of certain crops. Cultural change takes longer than the 3 years that the project will be implemented. Despite demonstrating the potential of the planting improved crop varieties, their adoption may lag behind due to cultural norms that are confounded by poverty. Strategies for influencing farmers to adopt new crop varieties compared to local ones will evolve with time despite the potential benefits. However the project has an intuitive strategy of targeting lead farmers that can generate success stories and induce fast adoption. Existence of the land tenure system in some of the project areas too is another challenge that can slow adoption of best-bet/best-fit technologies. This is because farmers that rent land are prohibited by the land owners in applying fertilizers on their farms. 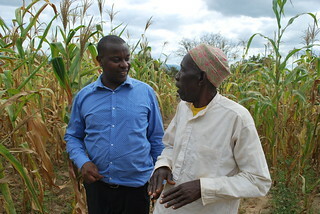 Therefore the project should also be training the land owners even if they are currently not involved in actual farming. What are some of the main achievements of this project so far? The main achievements include demonstrations of improved crop varieties that are high yielding and good agronomic practices and natural resource conservation measures such as water conservation in the rain-fed maize systems. Mapping of agro-ecologies suitable for growing different crop varieties and/or implementing best-bet/best fit technologies too is another significant achievement. After successful implementation of the project in 3 regions, initial plans have been initiated to expand the benefits to Iringa and Mbeya regions. 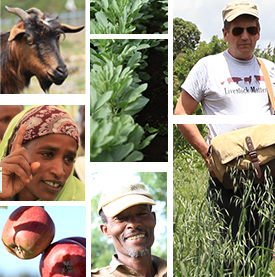 What do you most want to accomplish in your work with Africa RISING-NAFAKA scaling project? I am aiming at developing accurate and reliable geospatial models to generate recommendation domains to guide thematic scientists locating sites with the highest probability of success if the best-bet technologies are implemented there. This will improve adoption rates that I identified as the main challenge. Tags: africa rising, IITA, interview, nafaka, RISING voices, Scaling, Tanzania. Bookmark the permalink.